Why think of shade gardens as dull? Combinations of plants with foliage of varying colors, sizes, textures and forms create beautiful gardens that look amazing throughout the season. Heucheras (Coral Bells) are hardy perennials which have leaves of burgundy, green or red. They also produce small, light flowers that rise above the leaves. 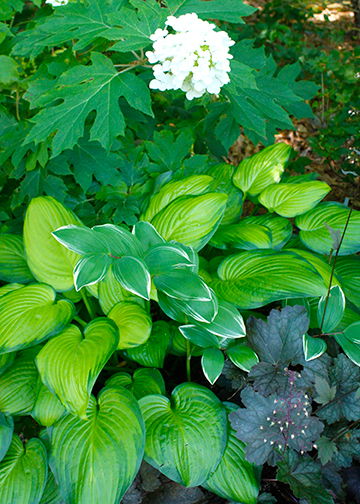 In shade gardens they work well with hostas, astilbes, hydrangeas and ferns. In the photo the Heuchera is the dark purple plant in the lower right corner. Other plants included are the Oakleaf Hydrangea with the white bloom, a variegated hosta and Polygonatum (Solomon’s Seal), in the center.